Naxos disease associates arrhythmogenic right ventricular cardiomyopathy/dysplasia (ARVC/D) with woolly hair and palmoplantar keratoderma (naxos arrhythmogenic cardiocutaneous syndrome). It is a genetically determined desmosomal defect, usually with an autosomal recessive inheritance; however, dominant forms have also been reported. 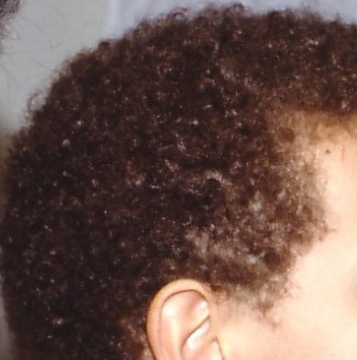 Woolly hair is usually present from birth (Figure 1). Later in infancy, erythema followed by hyperkeratotic lesions develop over the pressure areas of the palms and soles (Figure 2). Usually there are no signs of heart disease up to the age of 12 years. At that point, initial findings include premature ventricular beats and minor depolarization abnormalities consisting of prolongation of terminal activation duration of the QRS complex on anterior precordial leads (V1-V3) more or equal than 55ms on a 12-lead standard electrocardiogram (ECG) and/or late potentials on signal-averaged ECG. Tiny waves at the end of QRS complex or at the beginning of ST segment are specific 12-lead ECG findings (Figure 3). In ages older than 14 years, T-wave inversion in anterior precordial leads beyond V1 remains or appears. Twelve-lead resting ECG of a patient with Naxos disease diagnostic for ARVC/D repolarization and depolarization abnormalities. Right ventricular structural/functional alterations (regional akinesia, dyskinesia or aneurysm and dilatation) detectable on 2-dimensional echocardiography, cardiac magnetic resonance (CMR) or angiography usually follow the ECG changes. Left ventricular involvement, being related to age and disease severity, ranges from regional hypokinesia mainly of posteroapical wall to global dilatation and diffuse hypokinesia. Late enhancement imaging on CMR suggests early left ventricular involvement (fibrosis at subepicardial/mediomural layers). Palpitations, presyncope or syncope are alarming signs of severe ventricular arrhythmia development (Figure 4). Nonetheless, sudden death might be the first manifestation of ARVC/D. Ventricular tachycardia of 250 beats per minute, in a patient with Naxos disease cardioverted by DC-shock. Family history of similar cardiocutaneous phenotype and/or parental consanguinity should be sought. Skin histology reveals nonspecific features of keratoderma. Endomyocardial biopsy performed upon clinical indications reveals myocyte degeneration with strands of surviving myocytes surrounded by fibrous tissue embedded within adipocytes. Lymphocyte infiltrates might be observed, particularly when biopsy is performed at the time of clinical progression (“hot phase” of ARVC). Since involvement of ventricular myocardium is regional and the pathologic process extends mainly from subepicardial to mediomural layers, the sensitivity of endomyocardial biopsy is rather low. It might be increased when sampling is guided by cardiac imaging or electroanatomic voltage mapping. Right ventricular free-wall endomyocardial biopsy should be performed in highly experienced interventional cardiology laboratories, taking the appropriate precautions to prevent myocardial perforation; resistance in withdrawing the biopsy sample is an indication of thin fibrotic area, so another site should be selected. In patients with left ventricular involvement, myocardial loss with fibrous or fibrofatty replacement has been observed mainly at subepicardial layers of posteroapical wall. Immunohistology of myocardium reveals reduced plakoglobin signal at intercalated disks, independently of the mutated protein or the site of endomyocardial biopsy. Genetic evaluation may reveal either recessive or dominant mutations in desmosomal proteins (Figure 5, Figure 6). ARVC/D is diagnosed when 2 major diagnostic criteria, or 1 major plus 2 minor, or 4 minor criteria are fulfilled. (Figure 7). Most reports of Naxos disease come from countries of the East Mediterranean area. However, a few cases have been described in other places in the world. The incidence of heterozygous carriers of plakoglobin mutation (2157del2) in the population of the Aegean islands has been estimated in up to 5%. Although heterozygous carriers do not develop the disease, being parents transmits a risk of homozygosity in 25% of every child. Few heterozygotes present with woolly hair with or without mild palmoplantar keratoderma and minor cardiac abnormalities not fulfilling the diagnostic criteria for ARVC/D. The hair/skin phenotype in a child should alert for signs of cardiomyopathy. Annual follow-up with resting 12-lead ECG, signal-averaged ECG, 24-hour ambulatory ECG and 2-dimensional echocardiography targeted to detection of early signs consistent with ARVC/D should be applied after the 10th year of age. The first gene identified for Naxos disease and also for ARVC/D is a mutation in plakoglobin (JUP) resulting in frameshift and premature termination of translation. This homozygous 2-base-pair 2157 deletion of the protein gene results in Naxos cardiocutaneous phenotype. In the protein product, the last 5 amino acid residues in the 13th armadillo repeat have been altered, with truncation of the C-terminal domain by 56 residues. Plakoglobin is a multifunctional adhesive and signaling protein of both adherens junctions and desmosomes (area composita). Consequently, recessive, dominant or compound heterozygous mutations in other desmosomal proteins (desmoplakin and desmocollin-2) have been identified to underly Naxos arrhythmogenic cardiocutaneous syndrome. Under the recent advances in characterization of ARVC/D as arrhythmogenic cardiomyopathy (by inclusion of left dominant disease), the term Naxos arrhythmogenic cardiocutaneous syndrome is considered more appropriate. Plakoglobin is a linker and signaling molecule. At the outer dense plaque of desmosomes joined with plakophilin, another armadillo protein, plakogloblin interlinks desmosomal cadherins to desmoplakin. The whole complex is a securing anchorage of intermediate filaments of desmin (myocardium) or keratin (epidermis) to the cell membrane. Plakoglobin is also essential in hair follicle proliferation and differentiation, a mechanism shown to be critically dependent on cell-cell attachment, its signaling role mainly expressed by competing with β-catenin in its Wnt signaling pathway. This is involved in regulation of cell growth, survival or death of epithelial tissues. Therefore, plakoglobin apart from being a buckle in the cell-cell adhesive chain, shows a significant signaling role. Recent studies have indicated that plakoglobin is required for pemphigus antibodies to disrupt desmosomal adhesion. When plakoglobin is released from desmosomal plaque, due to a desmosomal protein defect, it might be translocated to the nucleus, possibly involved in transcriptional pathways. The observation that palmoplantar keratoderma is a result of increased mechanical stress applied at these areas provides a working hypothesis for myocyte cell death in ARVC. On the other hand, keratoderma possibly reflects alterations in the keratinocyte differentiation program driven by desmosomal components. Involvement of a particular signalling mechanism might be fundamental in ARVC/D pathogenesis. Immunohistology and electron microscopy of the heart in patients with Naxos disease confirm desmosomal dysfunction and support a relation to gap junction remodeling. This leads to an alternative pathway leading to intraventricular micro-reentry defects that might enhance the risk for ventricular arrhythmias (Figure 4). Asimaki et al recently have shown that localization of plakoglobin at intercalated disks was reduced in all studied cases of ARVC/D underlied by a desmosomal mutation independently of the primarily affected protein. Thus, plakoglobin seems to play a key role to a final common pathway in ARVC/D pathogenesis. – Palmar plantar keratoderma can be treated with lactic acid 5% to 12% cream or urea 10% to 20% cream on a daily basis if symptomatic. If asymptomatic, emollients are all that is required. – No therapy for the woolly hair is needed. Wooly hair does not need to be treated. The keratoderma is difficult to treat. Bland emolients can be attempted. Keratolytic agents such as lactic acid 5% or 12% cream or urea 10% cream can be attempted. For pruritus, traimcinalone 0.025% to 0.1% can be used twice daily for 2 weeks at a time. Oral antihistamines are not useful. The key to management is to have the patient follow up with a cardiologist who is fimiliar with the disease. Although it is a rare disease mostly reported from East Mediterranean area, sporadic cases of Naxos syndrome have been reported from northern Europe, Spain and India. Sometimes associated with alopecia (early loss of hair) or dental anomalies. Mild cutaneous manifestations of Naxos syndrome should equally alert for cardiomyopathy signs and target to ARVC/D clinical/laboratory evaluation. Basso, C, Ronco, F, Marcus, F, Abudurheman, A, Rizzo, S, Frigo, AC. “Quantitative assessment of endomyocardial biopsy in arrhythmogenic right ventricular cardiomyopathy/dysplasia: an in vitro validation of diagnostic criteria”. Eur Heart J. vol. 29. 2008. pp. 2760-71.